The other day, while hanging out on Sparkpeople, I read a comment from my friend Laura(FITFORMYKIDS). She had "found" some pounds which were previously lost and was looking for a way to keep her motivation going. She mentioned making a vision board. Laura's comment really "sparked" something in me (pardon the pun). 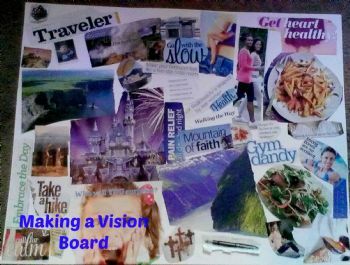 It has been more than 3 1/2 years since I made my last vision board. I've never made one. It looks interesting though. It's been about 3 years for me and I've been 'gathering' little things to create a new one. I change. So It's time to change my goals and dreams. Thanks for the blog. It's great.